1. being highly resistant to a disease because of the formation of humoral antibodies or the development of immunologically competent cells, or both, or as a result of some other mechanism, as interferon activities in viral infections. 2. characterized by the development of humoral antibodies or cellular immunity, or both, following antigenic challenge. 3. produced in response to antigenic challenge, as immune serum globulin. immune response the reaction to and interaction with substances interpreted by the body as not-self, the result being humoral and cellular immunity. Called also immune reaction. The immune response depends on a functioning thymus and the conversion of stem cells to B and T lymphocytes. These lymphocytes contribute to antibody production, cellular immunity, and immunologic memory. Disorders of the Immune Response. Pathologic conditions associated with an abnormal immune response (immunopathy) may result from (1) immunodepression, that is, an absent or deficient supply of the components of either humoral or cellular immunity, or both; (2) excessive production of gamma globulins; (3) overreaction to antigens of extrinsic origin, that is, antigens from outside the body; and (4) abnormal response of the body to its own cells and tissues. Those conditions arising from immunosuppression include agammaglobulinemia (absence of gamma globulins) and hypogammaglobulinemia (a decrease of circulating antibodies). Factors that may cause or contribute to suppression of the immune response include (1) congenital absence of the thymus or of the stem cells that are precursors of B and T lymphocytes; (2) malnutrition, in which there is a deficiency of the specific nutrients essential to the life of antibody-synthesizing cells; (3) cancer, viral infections, and extensive burns, all of which overburden the immune response mechanisms and rapidly deplete the supply of antigen-specific antibody; (4) certain drugs, including alcohol and heroin, some antibiotics, antipsychotics, and the antineoplastics used in the treatment of cancer. Overproduction of gamma globulins is manifested by an excessive proliferation of plasma cells (multiple myeloma). hypersensitivity is the result of an overreaction to substances entering the body. Examples of this kind of inappropriate immune response include hay fever, drug and food allergies, extrinsic asthma, serum sickness, and anaphylaxis. Autoimmune diseases are manifestations of the body's abnormal response to and inability to tolerate its own cells and tissues. For reasons not yet fully understood, the body fails to interpret its own cells as self and, as it would with other foreign (not-self) substances, utilizes antibodies and immunologically competent cells to destroy and contain them. immune system a complex system of cellular and molecular components whose primary function is distinguishing self from nonself and defense against foreign organisms or substances; see also immune response. The primary cellular components are lymphocytes and macrophages, and the primary molecular components are antibodies and lymphokines; granulocytes and the complement system are also involved in immune responses but are not always considered part of the immune system per se. 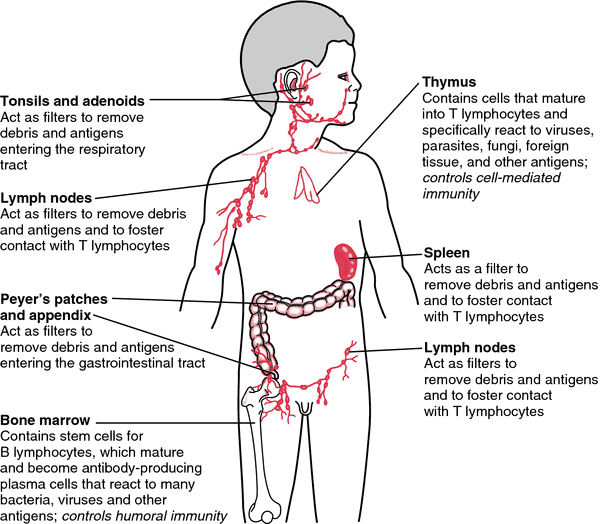 Major organs and tissues of the immune system in the child. From McKinney et al., 2000.
immune complex disease local or systemic disease caused by the formation of circulating antibody-antigen immune complexes and their deposition in tissue, due to activation of complement and to recruitment and activation of leukocytes in type III hypersensitivity reactions. acute phase response a group of physiologic processes occurring soon after the onset of infection, trauma, inflammatory processes, and some malignant conditions. The most prominent change is a dramatic increase of acute phase proteins in the serum, especially C-reactive protein. Also seen are fever, increased vascular permeability, and a variety of metabolic and pathologic changes. anamnestic response the rapid reappearance of antibody in the blood following introduction of an antigen to which the subject had previously developed a primary immune response. auditory brainstem response ABR; a special hearing test that tracks the nerve signals arising in the inner ear as they travel along the auditory nerve to the brain region responsible for hearing. A small speaker placed near the ear makes a clicking sound, and special electrodes record the nerve signal as it travels. The test can determine where along the nerve there is a lesion responsible for sensorineural hearing loss. It is often used for individuals with such loss in just one ear; this is often caused by a benign tumor along the auditory nerve, but if the ABR reading is normal in a given region, the chances of there being a tumor there are small. This test can also be used on infants since it requires no conscious response from the person being tested. autoimmune response the immune response in which antibodies or immune lymphoid cells are produced against the body's own tissues. See also autoimmune disease. conditioned response see conditioned response. dysfunctional ventilatory weaning response a nursing diagnosis adopted by the North American Nursing Diagnosis Association, defined as inability of a patient to adjust to lowered levels of mechanical ventilator support, which interrupts and prolongs the process of weaning. See also mechanical ventilatory weaning. galvanic skin response the alteration in the electrical resistance of the skin associated with sympathetic nerve discharge. immune response see immune response. inflammatory response the various changes that tissue undergoes when it becomes inflamed; see inflammation. post-trauma response former name for the nursing diagnosis post-trauma syndrome. reticulocyte response increase in the formation of reticulocytes in response to a bone marrow stimulus. triple response (of Lewis) a physiologic reaction of the skin to stroking with a blunt instrument: first a red line develops at the site of stroking, owing to the release of histamine or a histamine-like substance, then a flare develops around the red line, and lastly a wheal is formed as a result of local edema. unconditioned response an unlearned response, i.e., one that occurs naturally, in contrast to a conditioned response. 2. the response of the immune system to an antigen (immunogen) that leads to the condition of induced sensitivity; the immune response to the initial antigenic exposure (primary immune response) is detectable, as a rule, only after a lag period of from several days to 2 weeks; the immune response to a subsequent stimulus (secondary immune response) by the same antigen is more rapid than in the case of the primary immune response. An integrated bodily response to an antigen, especially one mediated by lymphocytes and involving recognition of antigens by specific antibodies or previously sensitized lymphocytes. a defense function of the body that protects the body against invading pathogens, foreign tissues, and malignancies. It consists of the humoral immune response and the cell-mediated immune response. In the humoral immune response, B lymphocytes produce antibodies that react with specific antigens. The antigen-antibody reactions activate the complement cascade, which causes the lysis of cells bearing those antigens. The humoral response may begin immediately on invasion by an antigen or up to 48 hours later. In the cell-mediated immune response, T lymphocytes mobilize tissue macrophages in the presence of foreign antigens. Also called immune reaction. See also humoral immunity, immune system. 1. Any response of the immune system to an antigen including antibody production or cell-mediated immunity. an antagonistic and specific host reaction in response to foreign ANTIGENS, involving the formation of ANTIBODIES by B-CELLS (or a cell-mediated response by T-CELLS). When such antibodies are present in the body, the individual is said to possess IMMUNITY against the specific antigen that stimulated the antibody production. The immune response is a vital defence mechanism but creates severe problems with the transplant of organs, such as kidneys, from donors. In these cases the tissues are ‘matched’ for tissue compatibility and the recipient treated with chemicals that reduce the immune response. A response from the body to an antigen that occurs when the antigen is identified as foreign and that induces the production of antibodies and lymphocytes capable of destroying the antigen or making it harmless. 1. being highly resistant to a disease because of the formation of humoral antibodies or the development of immunologically competent cells, or both, or as a result of some other mechanism, such as interferon activities in viral infections. 2. characterized by the development of antibodies or cellular immunity, or both, following exposure to antigen. 3. produced in response to antigen, such as immune serum globulin. The essential feature of antibody and cell-mediated immunity is that they are highly antigen specific. the binding of antibody-antigen-complement complexes to complement receptors found on red blood cells. disease induced by the deposition of or association with antigen-antibody-complement complexes in the microvasculature of tissues. Fixation of complement component C3 by the complexes initiates inflammation. See also serum sickness, hypersensitivity. one in which animals have inadequate immune responses and so are more susceptible to infectious disease. The defect may be primary (inherited), or secondary (acquired) which usually develops after birth because of toxins or infectious agents. See also combined immune deficiency syndrome, hypogammaglobulinemia, agammaglobulinemia, inherited parakeratosis, chediak-higashi syndrome and canine granulocytopathy syndrome. see immune-mediated hemolytic anemia (below). aseptic fever occurring in anaphylaxis, angioedema. the specific response to substances interpreted by the body as not-self, the result being humoral and cellular immunity. The immune response depends on a functioning thymus and the conversion of stem cells to B and T lymphocytes. These B and T lymphocytes contribute to antibody production, cellular immunity and immunological memory. See also humoral immunity. the detection by lymphocytes, especially T lymphocytes, of new antigens, particularly on tumor cells. consists of the primary lymphoid organs (thymus and Bursa of Fabricius or its equivalent (bone marrow) in mammals) and secondary lymphoid organs (lymph nodes, spleen and other lymphoid tissue). 40) Both groups experienced increased immune responses, regardless of treatment arm, indicating that HU does not have a substantial effect on HIV-specific immune responses. When they were give 50 mg a day-way above USRDA levels but still quite safe-tor replenish all their vitamin B-6 stores, their immune responses were boosted over the levels they had before they entered the study. However, in the context of providing a method of the sensitivity required for hazard identification and characterization and for evaluating the inherent potential of a protein to induce the quantity and quality of an immune response required for the elicitation of an IgE response, this is the most appropriate approach. Eric Rosenberg and Bruce Walker of Massachusetts General Hospital, shows that all of the people in their study who took Remune developed strong anti HIV immune responses during a planned treatment interruption, while none of the people who only took antiviral medicine developed these responses. Since respiratory virus infection induces enlargement of the mediastinal lymph nodes early in the immune response and since these lymph nodes contain a relative small number of mCTL after initial exposure, a strong recruitment from circulating T cells occurs, or alternatively, clonal expansion of the resident mCTL takes place (39). Assuming that we can choose our attitudes to some extent, look on the bright side and possibly enjoy a better immune response and less stress. Immune Response also suspects that the vaccine is a victim of lingering bias against Salk's killed-virus approach - a prejudice that dates back to the advent of Salk's polio vaccine. This allows for exploitation of both known and unknown tumor antigens to stimulate immune responses. The trial also showed the vaccine was capable of producing an immune response against cancer cells, with patients experiencing an increase in cytokine production, antibody response and evidence of T-cell proliferation. In contrast, rhesus macaques infected with SIV mount a vigorous immune response but eventually lose immune function and die. There are several biological reasons for believing that an immune response directed against Tat (or possibly Gag) may be particularly effective in controlling HIV.